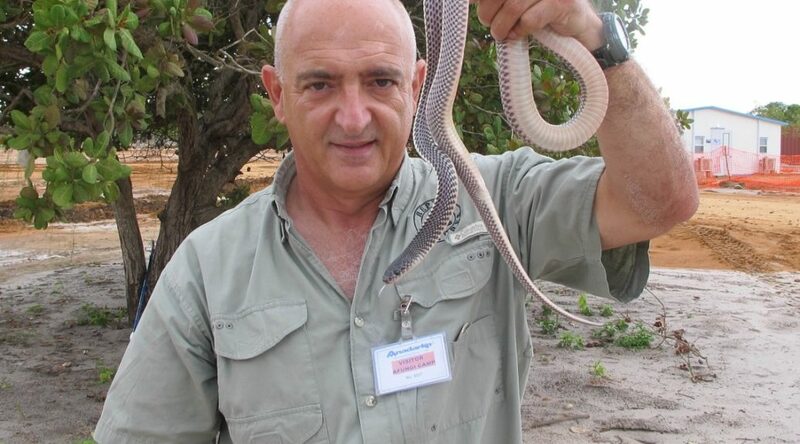 You can ask Johan Marais, the man behind the African Snakebite Institute, anything about snakes. 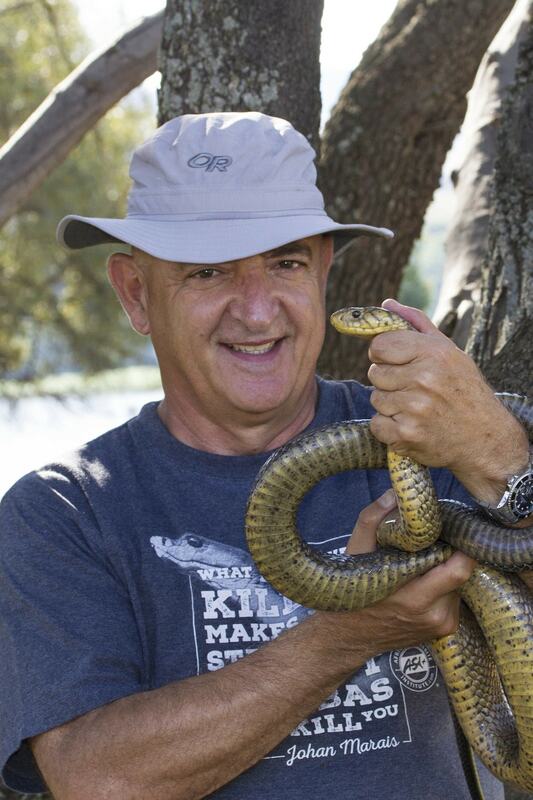 Not only has he authored several books that delve into the world of snakes, but he teaches nature lovers across Africa about snake awareness, first aid for snakebites and much more. 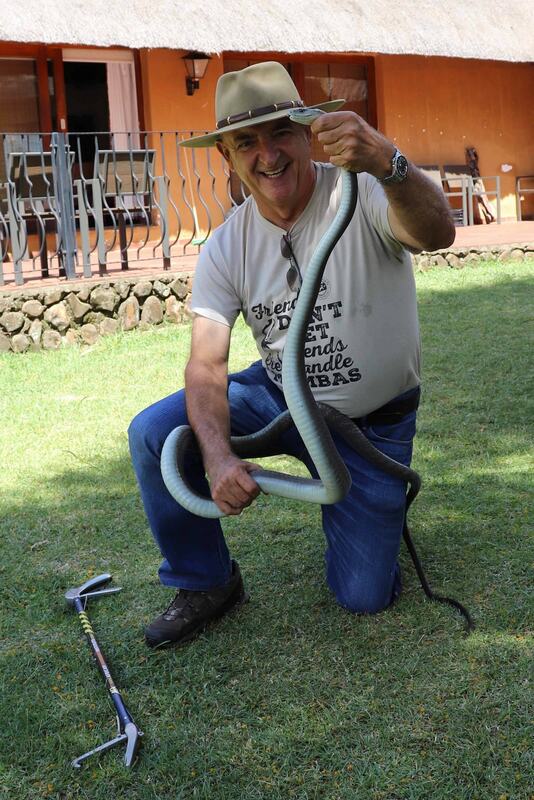 So that other travellers may benefit, Arnold Ras asked Johan about his work with the African Snakebite Institute (ASI) and what to do when you encounter a snake. ASI informs and educates people across Africa. Could you tell us a bit more? I started the ASI about eight years ago and our focus is snake awareness, first aid for snakebite, snake handling courses, and assisting with emergency protocols for snakebite. We are also the largest supplier of snake handling equipment in Africa with a lot of product development done by ourselves. Another ASI initiative is free training on snakes and snakebite management for medical doctors throughout South Africa. You’re on a self-drive trip somewhere in Africa and come across a snake. What to do, and what not to do? Never try to catch or kill a snake. Slowly move away from it. With five or more metres between yourself and the snake, you are perfectly safe. Snakes don’t purposely attack people, they strike only in self-defence. What are the situations that put people at risk? Trying to catch or kill a snake is very risky. Another major problem is that many people that have somewhat of an interest in snakes or who have read a snake book or two, come across a snake and suddenly become an ‘expert’. I see many folks in ICU that tried to catch what they thought was a harmless snake or used braai tongs to catch a venomous snake. Could you explain why people get bitten? If we look at snakebite cases where people end up in hospital, most bites happen in the early evening from January to April when snakes are most active. Around 85% of all victims are bitten well below the knee when accidentally standing on a snake. Reaching for ledges when climbing mountains, collecting firewood or sticking your hands in places where you cannot see them is risky. So is tampering with seemingly dead snakes – remember that a number of snakes play dead and will bite if handled. What should you do in case of a snakebite? First aid for snakes is somewhat involved. If you plan on travelling through Africa, you’d be well advised to familiarise yourself with the emergency procedures. 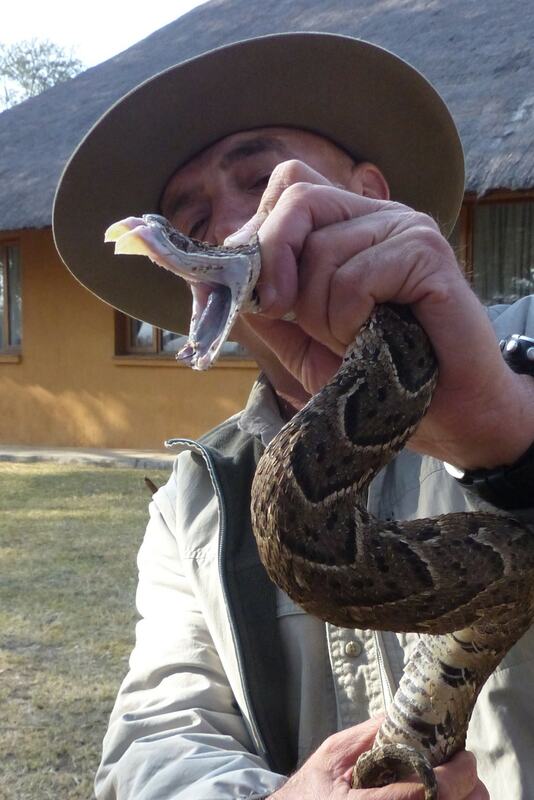 My book Snakes & Snakebite in Southern Africa explains step by step what to do and what not to do. A tourniquet will do more harm than good. How readily available is antivenom throughout Africa? It’s a matter of money. Antivenom is very expensive at around R15,000 to R20,000 per treatment for the antivenom alone. 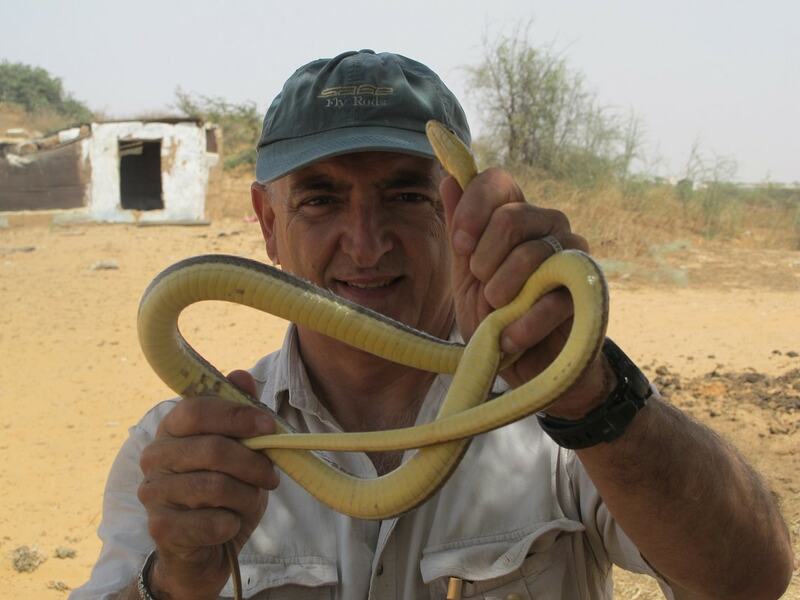 There are around 20,000 snakebite deaths a year in North Africa – most could be prevented if the availability of antivenom improved. Is it a solution to travel with antivenom if you’re going on an overlanding trip? Carrying antivenom on an overland trip is not advisable. Antivenom is seldom needed after a bite and should only be administered by a medical doctor in a hospital environment. For a single treatment you would need 10–15 vials of polyvalent antivenom, or 2–3 vials of monovalent boomslang antivenom. The antivenom must be kept refrigerated and expires after three years. The main reason why laypersons should not administer antivenom is that they are not capable of judging the severity of a bite to decide when antivenom should be given. Also, a number of people are allergic to antivenom with some going into anaphylactic shock. The best route is to get a snakebite victim to hospital as quickly as possible. The vast majority of victims who are hospitalised will survive. Your favourite snakes on the African continent? Green mamba first, then the black mamba, and lastly, the berg adder. The green mamba is just gorgeous, graceful, secretive and really difficult to find. Black mambas are poorly understood and suffer from bad press. They are by no means aggressive but rather very nervous and quick to avoid people. Very few people are bitten by this snake. We still have a lot to learn about the colourful little berg adder’s venom. In some areas we see only pain and swelling, while in other areas patients have to be intubated and ventilated for days, they lose all sense of taste and smell, and experience double vision or blindness as well as ptosis [drooping of the upper eyelid]. Previous PostLatest traveller tips for Liuwa PlainNext PostNew pics on T4A’s featured destinations – add yours! To be honest I have a rather irrational fear of snakes; it’s not a matter of not caring for the reptiles, it’s a full blown irrational response when I find myself in close quarters of the creatures. Simple garden snakes bring out the worst in me.